go team, originally uploaded by jahansell. 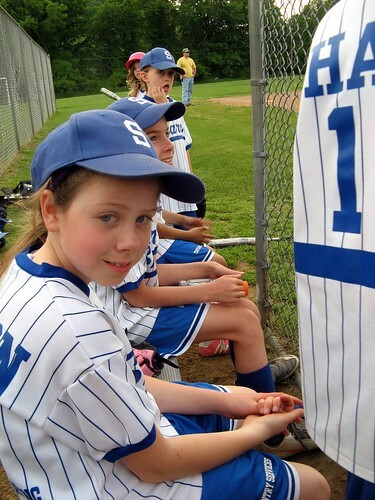 Today is the last game for the Sharon Rec girls' softball team. They are scrappy, tough and talented, but they are also small - mostly third-graders and most of their opponents have been fifth grade or above. So sadly, they haven't won a game. (A few recent games were canceled because of weather, including a giant storm that knocked out power for days to thousands of people.) But today they play North Canaan, which, we hear, is also made up of littler girls. So we have a chance to end our season on an up note! And either way, there's lots of great life lessons to be learned. (Not that I'd know what they are - I never played team sports myself - it wasn't an option for girls back in the stone age!) And, next year, they'll be a year older and stronger - that much more able to throw the ball ALL the way to first base!